Polaiteoir Briotanach ab ea Margaret Hilda Thatcher, An Banbharún Thatcher, a rugadh faoin ainm Margaret Hilda Roberts ar 13 Deireadh Fómhair 1925 agus a d'éag ar 8 Aibreán 2013. Bhí sí ina ceannaire ar an bPáirtí Coimeádach ó 1975 go dtí 1990. Sa bhliain 1979, d'éirigh sí ina Príomh-Aire na Ríochta Aontaithe. Ba ise an chéad Phríomh-Aire baineann ar an mBreatain. Rugadh in Grantham, Lincolnshire i Sasana í. Ba as Drom an Easaigh i gContae Chiarraí, a sin-seanmháthair Catherine Sullivan, a d'aistrigh go Sasana sa bhliain 1811. Phós Catherine oibrí feirme darbh ainm Thomas Smith agus phós Ellen, a iníon, Benjamin Ebenezer Roberts. 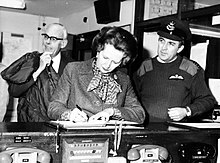 Athair Thatcher ab ea a mac Alfred. B'iníon Margaret le hAlfred agus Beatrice Roberts. Grósaeir ab ea a hathair, a raibh siopa aige in Grantham, agus is os cionn an tsiopa a bhí cónaí ar a teaghlach agus í ag fás aníos. Ba chomhairleoir áitiúil é Alfred Roberts, freisin. Cé nár bhall é d'aon pháirtí polaitiúil, bhí a chuid tuairimí agus polasaithe coimeádach. Bhí gaol an-láidir idir í agus a hathair, ach ní raibh caidreamh ró-mhaith aici lena máthair. Bhain sí céim amach sa cheimic ó Ollscoil Oxford sna 1940í. Agus í ag staidéar in Oxford, ba bhall í de na Coimeádaigh Óga. I 1951, phós sí Denis Thatcher, ball eile den Pháirtí Coimeádach. Fear colscartha ab ea Denis, a bhí deich mbliana níos sine ná Margaret. Bhí beirt pháiste acu, an cúpla Mark Thatcher agus Carol Thatcher, a rugadh i 1953. Sheas Margaret Thatcher gan rath i dtoghcheantar Dartford sna holltoghcháin i 1950 agus 1951. Toghadh í mar Fheisire do Finchley i 1959. Nuair a bhí sí ina Rúnaí Oideachais i rialtas Edward Heath ó 1970 go dtí 1974, chuir sí deireadh le dáileadh bainne saor in aisce i scoileanna. Dá bhrí seo, tugadh Maggie Thatcher, Milk Snatcher uirthi. Toghadh í mar cheannaire ar an bPáirtí nuair a sheas sí i gcoinne Heath i 1975 tar éis don Pháirtí dhá olltoghcháin a chailleadh i 1974. Ceannaire an Fhreasúra ab ea í anois. Bhí a cuid polasaithe ar an eite dheas. Ba é ceann dá polasaithe is cáiliúil ná an t-airgeadachas. Bhí sí go mór i gcoinne an tsóisialachais agus na gceardchumann. De bharr a tuairimí faoin gcumannachas agus a polasaí maidir leis an Aontas Sóivéadach, thug na Sóivéadaigh an leasainm cáiliúil The Iron Lady ("An Bhean Iarainn") uirthi. San olltoghchán i 1979, bhuaigh na Coimeádaigh móramh i dTeach na dTeachtaí agus toghadh Thatcher mar Phríomh-Aire. Bhuaigh siad na holltoghcháin i 1983 agus 1987, freisin, faoi cheannas Thatcher. Chuir sí polasaithe ‘nualiobrálacha’ i bhfeidhm sa Ríocht Aontaithe a spreag an earnáil airgeadais go mór agus thacaigh sí go láidir le seasamh Uachtarán Mheiriceá, Ronald Reagan, in éadan an Aontais Shóivéadaigh. Nuair a d'ionsaigh an Airgintín Oileáin Fháclainne i 1982, sheol sí fórsa chun na hoileáin a chosaint. Bhí an Bhreatain buacach sa chogadh. Bhí an-mhíshástacht sa Bhreatain i leith riail Thatcher ag tús na 1980idí. Ach mhéadaigh bá an phobail dí nuair a bhuaigh an Bhreatain Cogadh na Falklands-Malvinas. Ba ina dara téarma a tharla Stailc na Mianadóirí, a bhí ar siúl ó 1984 go dtí 1985. Faoi dheireadh, bhuaigh an rialtas ar na stailceoirí. Tharraing Thatcher tuilleadh conspóide de bharr na tacaíochta a thug sí do dheachtóir na Síle, Augosto Pinochet, agus dhiúltaigh sí tacú smachtbhannaí in éadan na hAfraice Theas nuair a bhí cinedheighilt i bhfeidhm. Bhí Thatcher go láidir i gcoinne an phoblachtachais Éireannaigh. I 1981, bhí ar Thatcher dul i ngleic le stailceoirí ocrais as an IRA agus an INLA sa Cheis Fhada i dTuaisceart Éireann. Bhí siad ag lorg stádas polaitiúil. Dhiúltaigh sí géilleadh d’éilimh an IRA go mbronnfaí stádas polaitiúil ar a gcuid príosúnach sa Tuaisceart. Níor thug Thatcher an stádas sin dóibh go dtí go raibh deichniúr príosúnach marbh, an Feisire Parlaiminte Bobby Sands ina measc, ach bhronn Thatcher na héilimh níos déanaí. Rinne sí beag is fiú de mholtaí an New Ireland Forum in 1984 i ráiteas cáiliúil ‘Out, Out Out’. Rinne an IRA iarracht í a mharú in 1984 nuair a bhuamáil siad comhdháil de chuid an Pháirtí Chaomhaigh in Brighton. Spreag dul chun cinn polaitiúil Shinn Féin sna 1980idí imní i Sráid Downing áfach. Bheartaigh Thatcher ról a thabhairt do Rialtas na hÉireann i rialú an Tuaiscirt sa Chomhaontú Angla-Éireannach, conradh a shín Thatcher le Poblacht na hÉireann i 1985, agus a spreag uafáis i measc an phobail Aontachtaigh sna sé chontae. D'éirigh sí as an an gCeannas agus as an bPríomh-Aireacht i 1990 tar éis di cuid mhór dá tacaíocht sa Pháirtí a chailleadh. Tugadh an post do John Major, ceann de thacaithe Thatcher. Tháinig galar Alzheimer nó néaltrú seanaoise uirthi timpeall na 1990idí. D'éag sí le stróc, is cosúil, i Londain ar an 8 Aibreán, 2013. Chaith Thatcher breis is 11 bhliain mar phríomh-aire ar an mBreatain – an t-achar is faide a chaith aon duine sa ról seo le linn an fichiú haois. Ba ea í an t-aon bhean í a raibh an post seo aici, roimh Theresa May. Tugadh an leathanach seo cothrom le dáta an 26 Eanáir 2018 ag 19:05.